LONG BEACH, California, Oct. 17, 2018 – Crimson Midstream, LLC, and MPLX LP (NYSE: MPLX), today announced the commencement of a binding open season to assess interest and solicit commitments from prospective shippers for transportation service on the Swordfish Pipeline. 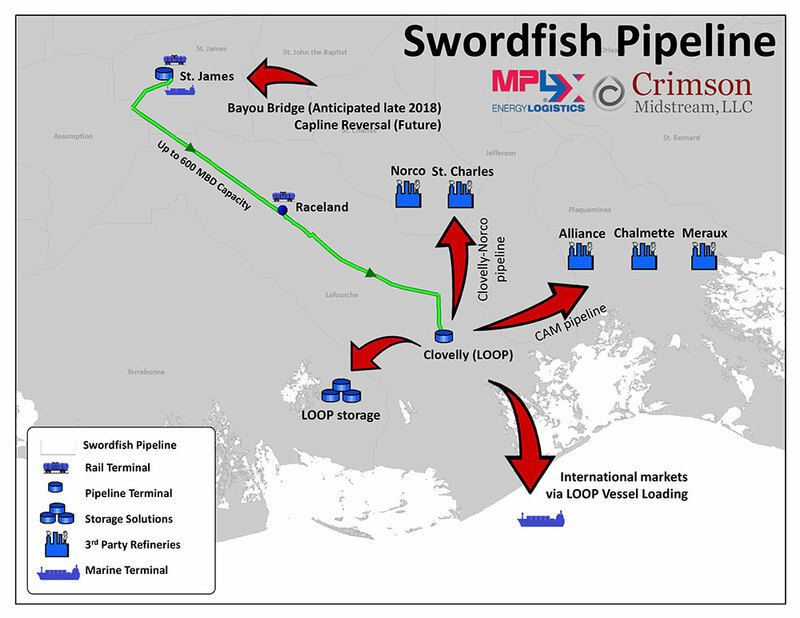 The Swordfish Pipeline is being jointly developed by Crimson and MPLX to provide connectivity from existing terminal facilities in St. James, Louisiana, and Raceland, Louisiana, to the Louisiana Offshore Oil Port LLC (LOOP) terminal facility in Clovelly, Louisiana. The proposed pipeline would be a multi-diameter batched system with the ability to transport up to 600,000 barrels of crude oil per day and provide shippers with access to storage services, vessel loading, as well as connectivity to other carriers at the Clovelly Hub. The in-service date for the Swordfish Pipeline is anticipated to be in the first half of 2020. The binding open season will begin at 8 a.m. CDT on Oct. 17, 2018, and will conclude at noon CST on Nov. 30, 2018. The binding open season provides interested shippers with an opportunity to secure transportation service on the proposed pipeline. The proposed Swordfish Pipeline would originate from terminal facilities in St. James, Louisiana, and Raceland, Louisiana, and provide service to the Clovelly Hub. Storage and further transportation services to end markets would be facilitated through the Clovelly Hub and connecting carriers. Pending shipper interest and final construction of the project, the Swordfish Pipeline is expected to be a multi-diameter (16”, 20” and 30”) batched system with the ability to transport various levels of capacity, from approximately 170,000 to 600,000 barrels of crude oil per day based on market demands. The completion of the Swordfish Pipeline will have minimal impact on current shippers on the Crimson system, as their ability to access the St. James and local refining markets will be maintained.